Are you ready for spring? I am so thankful it’s already here where we live, but I know this is not the case everywhere. 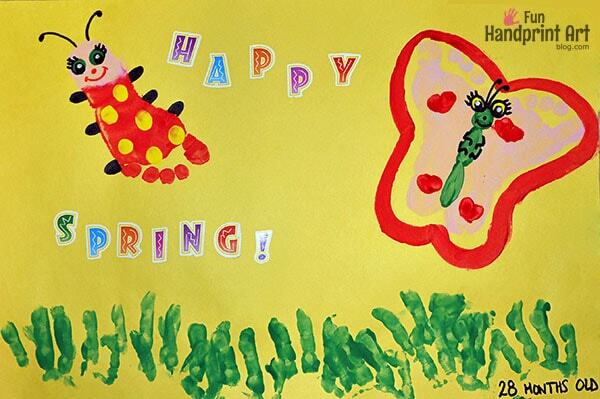 Whether it’s still Winter by you or not, here is a cheerful butterfly and ladybug footprint craft that’s sure to get you in spring mood! It’s inspired by the Melissa & Doug Bella Butterfly and Mollie & Bollie Ladybug toys my toddler girl loves. She is at the stage where she loves to match everything so this was extra fun for her. *This post contains affiliate links. Please read our full disclosure here for more info on this. Thanks! Choose your construction paper color and paint colors. I placed the paint colors we were using in a small, shallow bowl with a different paintbrush for each color laying next to it. We started with the footprint butterfly. You could make yours any color, of course, but we made ours by making 2 light pink footprints next to each other since that is what color Bella is. Leave a small gap between the footprints for the body. 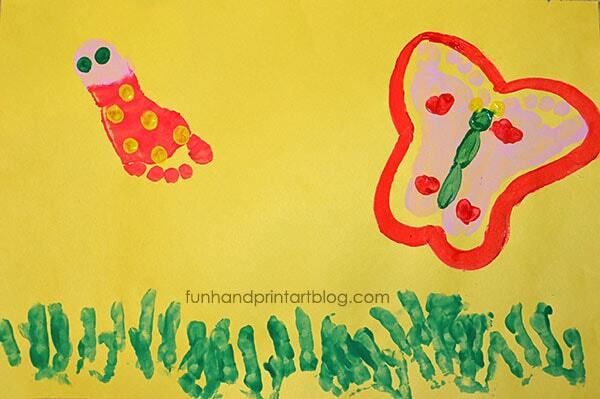 Use one painted finger to make a print in between the footprints. Make a thumbprint on top of this to create the butterfly’s head. Next, we made a footprint ladybug inspired by Mollie. Since her face is pink, I painted just the heel of my toddler’s foot pink and the rest with red. We made fingerprint grass by painting just her fingers green and then pressed them along the bottom edge of the paper. Repeat this process as much as you’d like. Set aside to dry. When the paint is dry, you can start decorating your bugs. There are endless possibilities to use for your designs. Thumbprints, sequins, buttons, glitter, googly eyes, pipe cleaners, gems, and markers are just a few ideas that would be fun. Since we were making ours look like her toys, we made yellow thumbprints on her ladybug and green thumbprints for the eyes. For the butterfly, we made red fingerprint hearts and yellow thumbprint eyes. Then, I outlined it with red paint. Finish the artwork by adding the face details and anything else you’d like. Some other ideas might be a cute spring poem, flower stickers, “Happy Spring!” and so on. Make a creative learning experience! Toddlers love to match things and this makes a fun opportunity to incorporate matching colors. You can set out the different paint colors and ask your toddler to pick which one matches the color of Bella Butterfly. You can do the same with the eyes, ladybug spots, and hearts. Even though they aren’t involved as much in the actual designing, the feel of the paint is a great sensory experience for them. Older toddlers and preschoolers can do as much as they can and adults can help with the rest. Older preschoolers and kindergartners can probably do most of the project with very little help. 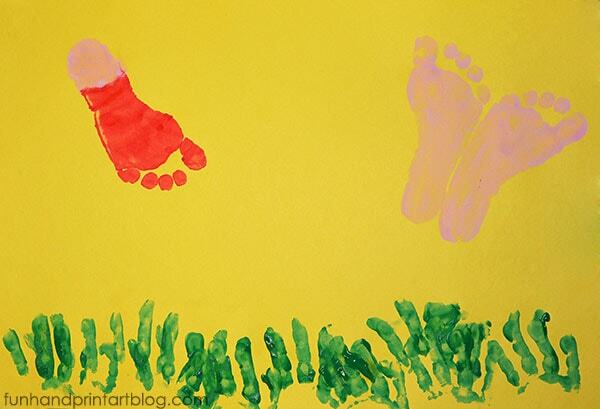 Variation: Kids may even enjoy tracing their feet and drawing/coloring their designs. 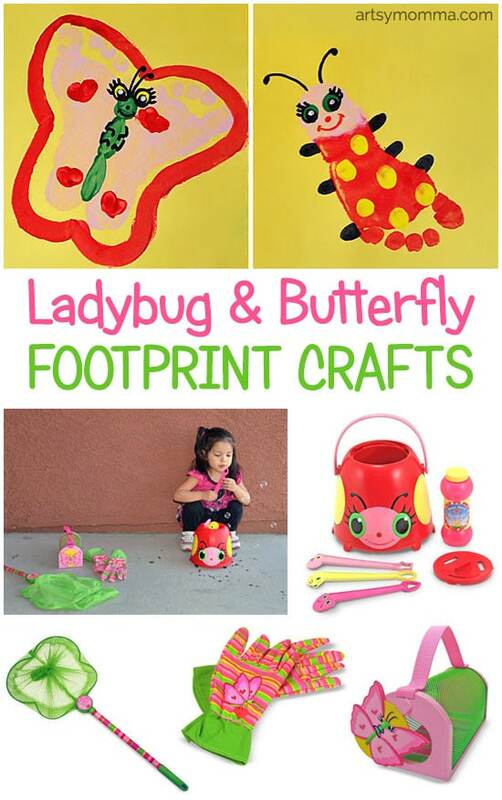 We hope you enjoyed our creative take on this darling butterfly and ladybug footprint craft! For more Spring-themed crafts to make with your little ones, try browsing this collection of Spring animals made from little hands and feet.